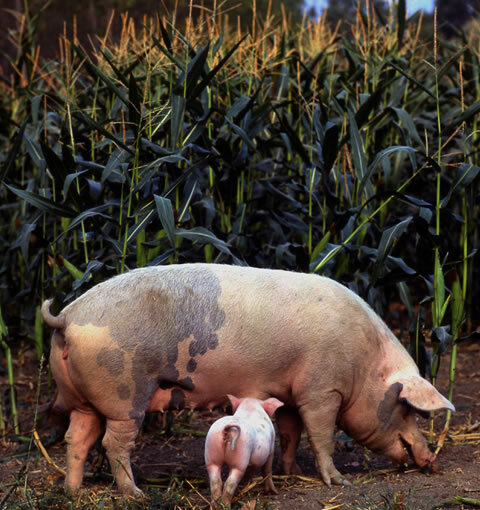 In almost all the children’s stories that I was told as a child the main characters were: a pig, a sow, some piglets and their owners. Stories of lowland people linked to these animals as though they were members of the family, so much so that they gave them names that affectionately identified their characteristics based on their coats, shape and size. So we came across: al macià (spotted), al ros (red), al negar (black), al curt (short), al gros (big), and al gras (fat). Different yes, but with a common “vocation”, that of providing exceptional salumi! In those days it all seemed so natural to me that I expected it to go on forever! The years passed and suddenly my illusions were shattered because, the stars of my stories had gone, and the pigs had all become thin and white! So then I started my dogged search, sacrificing my holidays for a decade. When I heard that there were some different pigs somewhere, I went, read up about them and bought some. But what disappointments in those early years! Until something interesting happened. 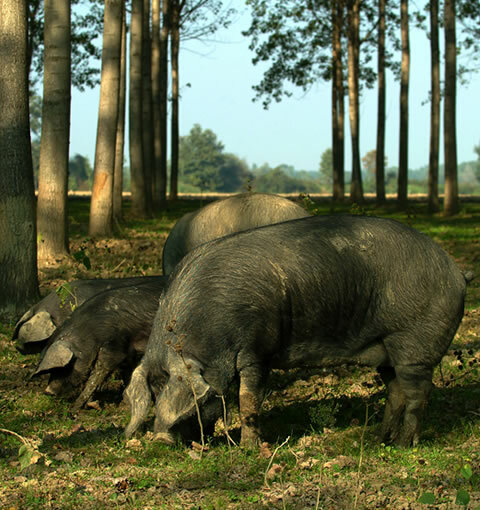 In places that were almost inaccessible I found al macià and through some tests I discovered that that breed was called borghigiana from the name of Borgo San Donnino (now Fidenza) and that it was famous because of the culatello and spalle that it produced. And this was confirmed by the detailed account given by the old butcher from Vidalenzo di Polesine, the legendary Gino da Schen. After fruitless trips to Romagna my perseverance was once more rewarded. The I found al ros, of which there were very few examples, in fact I was told that there were only about twenty, but I was very determined and in the end I managed to buy them. A much more difficult task seemed to be the search for al negar: almost everybody said the same thing: “the breed is totally extinct”, so finding it was impossible! But then one day Dr. Pietro Tanzi, a native of Rocca di Varsi, a small village perched on the Apennines, told me about a photograph from the late forties, that showed his grandmother together with a sow and her piglets. So the “hunt” began, and I rushed to the placed only to find the usual thin white pigs. So then I went back down the hills and arrived in Tuscany, and there many people knew about the black breed, but no-one had an example to show me much less to sell. I extended the search to the Marches, to Abruzzo and Molise, but there was nothing doing! Receiving some tips form experts in the sector, I decided to take a look in Spain too, and I set off for the southern destination of Jabugo, the land of the legendary “pata negra”, the most famous ham in the world, and in that area of mountains swarming with pigs out in the pastures, I bought all the books I could find on the subject. From the photos and from actual animals that I saw, I found that they were similar to the blacks of my memory but didn’t have what are called “wattles”: Based on information from a local breeder I learned that on the Iberian peninsular there are at least a dozen black breeds with different variations. More importantly, my informant told me that he remembered seeing one of them with the famous protuberance… that’s what I was looking for! Using my head I also realised why this old Spanish breed came to be found in the areas of Parma and Piacenza – the Bourbons! 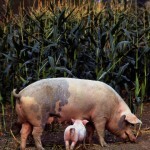 Yes, it was the nobles of Spain themselves, for many years the undisputed masters of the two provinces, who imported these pigs, considering them to be better than the native breeds. Sadly my search in that area remained fruitless, but I returned home happy anyway. The problem, at least from a historical point of view, was solved; but now I needed the animal in the flesh. Then came some information that had me once more heading for the Tuscan-Emilian hills. I was not too optimistic because I had already been there too many times for nothing! However, I had to try again! Once I arrived all my scepticism disappeared because, wonder of wonders, I found six black animals belonging to a farmer who said that he had been breeding them for years, because he didn’t like the meat of the modern breeds. Now I just had to buy them, and after protracted bargaining with the swineherd – and I’m not sure whether he was wily old bird or really fond of his little herd of pigs – I managed to obtain three: a male and two females. More good news arrived from Campania: at Caserta there were some examples with the afore-mentioned “wattles”. 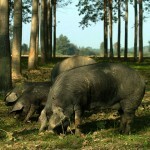 So I was able to buy three sows… I’d done it! Now I really had all the breeds that often used to appear in the sties of my children’s tales, and in sufficient numbers to be able to breed them. Once this long and tiring work had been completed, I began to ask myself some fundamental questions: what will the meat be like? Will it be any good? And if it is good, why were these pigs abandoned? The first answers were supplied by observing the way these animals lived on the farms and their development: they need four times as much space as whites, they sleep on straw and they need soil in which to root about. The sows produce a relatively small number of piglets, they grow slowly and in the end, when they are mature, they are enormous with incredible layers of lard that, until recently was considered to be of no use. Totally the opposite of the modern day white pig that manages to live, not much differently from chickens in a battery, in a very limited space where, not being able to move quickly, it converts all it eats into flesh. In the light of that, my research seemed almost anachronistic and impractical, a useless waste of time and money! And the moral becomes clear! Even if I try to create an alibi for myself, seeking a logical justification for my obstinacy, by telling myself: basically I have saved an ancient breed of my area from extinction, a work that must have some merit, setting aside the financial disaster. In the meantime the pigs grew and after about twenty months became marvellous great beasts of from 280-300 kilos, in short, as they say around here, “a picture”. We’re ready! Then I decided to butcher one of each breed, even though it saddened me somewhat: it wasn’t easy to give up valued parts of my collection. My researcher’s spirit however gets the upper hand, also because it’s only by checking the meat and the salumi produced from it that my years of research can bear fruitage! When I saw the parts of the pigs I could not believe my eyes: compact meat marbled with fat, with a beautiful ruby red colour, not pale like the others that are chosen to make them resemble veal as closely as possible, and fifteen centimetres of pink lard with beautiful veins of lean meat! And what can I say about the products made from it? When I tasted the culatello, the spalle, the salami and the salted lard, all produced using the old traditional methods, I was almost moved to tears. They were fantastic! The aromas and the flavours that were released were enough to make me feel like a child again! The experiment had worked perfectly, my time and effort had not been wasted. What satisfaction I got from those pigs that everyone thought were not economically viable, uncompetitive, all fat and no meat, in short not up to modern standards and fast intensive rearing. People are still always talking about the lean years when quantity was considered more important than quality. Unfortunately today times have changed! 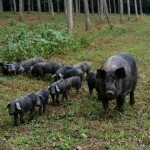 Following this new production philosophy, along with my brother we decided to buy some old piggeries, those that still had floors and walls of brick, in which to rear these old breeds, feeding them as they used to years ago with cereals produced on our farm, in order to continue producing those unique salumi that we Spigaroli have been making for four generations in the Antica Corte Pallavicina on the banks of the Po in Polesine Parmense.